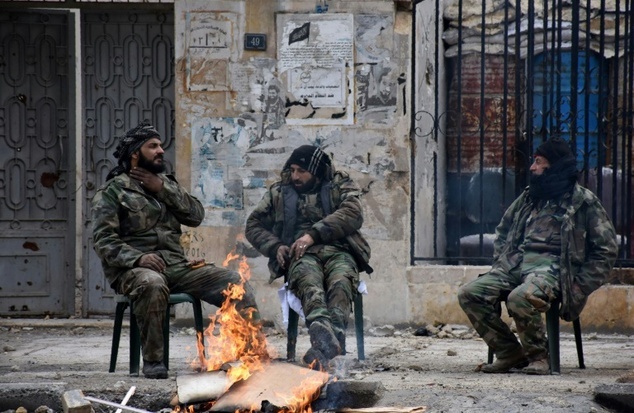 BEIRUT – Turkey and Russia are discussing a broader Syrian cease-fire after brokering the deal that evacuated rebel-held eastern Aleppo, Syrian opposition factions said Wednesday, but a number of rebel groups say they won't agree to anything until they get more details. All previous attempts at enforcing a nationwide cease-fire in Syria have failed. The recent warming of ties between Russia and Turkey, who provide crucial support to opposing sides of the war, may prove to be a game changer, but the challenges are immense. The foreign ministers of Turkey, Russia and Iran met in Moscow last week for talks on Syria that pointedly included no Syrians, indicating they prefer to pursue a grand bargain among great powers with stakes in the conflict rather than a domestic settlement between the government and the opposition. An official with one of the factions confirmed to The Associated Press that Russian and Turkish officials were debating a cease-fire proposal that would encompass the whole of Syria. He spoke on condition of anonymity because the talks were ongoing. Rebels have opposed previous proposals that would allow the government to continue its offensives around the outskirts of the capital, Damascus. Russia's Foreign Ministry said later Wednesday that its embassy in the Syrian capital was hit by mortar fire, blaming the attack on "extremists" opposed to a peaceful settlement. It said a mortar round landed in the embassy courtyard without exploding, and another fell in the vicinity. Turkey's Anadolu Agency said Wednesday morning that Ankara and Moscow had reached an agreement, and Turkish media reports quoted Foreign Minister Mevlut Cavusoglu as saying that a lasting cease-fire and political solution in Syria are "close." But no details were announced, and there was no confirmation from state officials. Yasin Aktay, the spokesman for Turkey's ruling Justice and Development Party, said the government is pushing for a cease-fire to be in place "as we enter 2017." The Syrian opposition official said factions were holding vigorous discussions over the possibilities, while an official with a different group said the proposal has not been formally presented to the opposition. "It is difficult to accept or refuse the matter before we look at the details, of course," said the official, who also spoke on the condition of anonymity so as not to prejudge intra-opposition talks. The Anadolu report quoted unnamed officials as saying a plan for a cease-fire "in all regions" would be presented to the warring parties. The cease-fire would exclude terrorist organizations, it said, without elaborating on which groups would be left out. It said peace talks in Kazakhstan would proceed under Russia and Turkey's leadership if the cease-fire holds, with the two acting as "guarantors" of any deal. Russian President Vladimir Putin's spokesman confirmed Russia and Turkey were in "constant contact" to prepare for planned Syria peace talks in Kazakhstan, but did not comment about the possibility of a cease-fire. Mosayyeb Naimi, a Tehran-based political analyst, said it was unclear whether Turkey could corral Syria's fractured opposition. "Turkey's ability to convince armed groups to accept the cease-fire is unknown, particularly because Turkey is involved in conflict with some of those groups," he said. Naimi added that although the Russians have made initial agreements with Ankara, they may be waiting for U.S. President-elect Donald Trump to take office to discuss the U.S. role in the cease-fire process. A top Russian diplomat meanwhile said a draft U.N. Security Council resolution that would impose sanctions on Syria for chemical weapons use is unacceptable to Moscow, which has veto power on the council. A resolution drafted by Britain and France, which was obtained by The Associated Press, would impose sanctions on an array of Syrian individuals, organizations and companies allegedly involved in chemical weapons attacks. It would also ban sales of helicopters to Syria. Deputy Foreign Minister Sergei Ryabkov was quoted by the state news agency Tass on Wednesday as saying the resolution "is categorically unacceptable to us. We warn them against attempts to fan tensions in the U.N. Security Council." In Syria, activists said at least 20 civilians have been killed in an airstrike on an Islamic State-held village in Deir el-Zour province in eastern Syria. The Britain-based Syrian Observatory for Human Rights reported Wednesday that several unknown warplanes bombed the village of Hajna the night before, killing 12 people from one family and 10 from another. It said at least 10 children were killed. Russia and Turkey were discussing a nationwide truce plan for Syria, and while Turkish state media on Wednesday said a deal had been reached, none of the key players in the conflict offered a confirmation. The state-run Anadolu news agency said the plan aims to expand a ceasefire in the city of Aleppo -- brokered by Turkey and Russia earlier this month to allow the evacuation of civilians -- to the whole country. If successful, the plan would form the basis of upcoming political negotiations between the Damascus regime and the opposition, overseen by Russia and Turkey in the Kazakh capital Astana, it added. But in a speech in Ankara after the report was published, President Recep Tayyip Erdogan made no reference to the plan, while Kremlin spokesman Dmitry Peskov said he could not answer on an issue "about which I don't have enough information". A Syrian rebel official confirmed to AFP that talks for a possible ceasefire were under way, but obstacles remained for any deal. Labib Nahhas, foreign relations head for the powerful Ahrar al-Sham rebel group, said the faction was "aware of ongoing discussions between Russia and Turkey about a nationwide ceasefire". "Russia wants to exclude Eastern Ghouta from the ceasefire, which is not acceptable," he said, referring to a rebel-held area outside Damascus. Syria's army has been advancing in Eastern Ghouta in recent months, and securing the area around the capital would be another major government gain after recapturing Aleppo. An official from the High Negotiations Committee -- which oversees political talks of the Syrian rebels -- said there was no information about a ceasefire so far. There was also no reaction from the Syrian regime. Anadolu said both sides were working for the ceasefire to come into force at midnight but gave no further details. The report came after Ankara has hosted a succession of closed-door talks between Russia and Syrian opposition rebels over the last weeks. Qatar-based channel Al-Jazeera said a new meeting is planned on Thursday in Ankara, this time between military representatives of Syrian rebels and Russia. Ankara and Moscow have been on opposing sides in the Syrian civil war, with Turkey seeking the ouster of President Bashar al-Assad, who is backed by Russia and Iran. But the two countries have recently started to cooperate more closely on Syria, especially after a deal in the summer to normalise ties battered by Turkey's shooting down of a Russian warplane last year. Turkey remained conspicuously quiet as Assad's forces, backed by Russia, took control last week of Aleppo in the biggest defeat so far for the rebels in the civil war. No date has yet been set for the Astana talks and Russian foreign ministry spokeswoman Maria Zakharova said the meeting was still at the planning stage. But the direct involvement of Turkey and Russia comes as Erdogan is increasingly expressing impatience at the role of the United States in Syria. Previous ceasefire plans had been brokered by US Secretary of State John Kerry and Russian counterpart Sergei Lavrov. They met with only temporary success and failed to lead to a solution for the conflict. It remains unclear how the latest ceasefire plan will apply to Fateh al-Sham, formerly the Al-Qaeda affiliate Al-Nusra Front. Erdogan had on Tuesday launched one of his most bitter attacks on US and Western policy in Syria. He accused the West of not just supporting Kurdish militia that Ankara regards as a "terror group" but even Islamic State (IS) jihadists. In an angry statement, the US embassy in Ankara said: "Assertions the United States government is supporting Daesh (IS) are not true." In continued bloodshed, air strikes carried out by unidentified aircraft killed at least 22 civilians, including 10 children, in a village held by IS in Deir Ezzor province, the Syrian Observatory for Human Rights said. Syria's conflict began in 2011 as an uprising against Assad but quickly morphed into a civil war after the regime unleashed a brutal crackdown against dissent. 0 Response to "Report: Turkey, Russia agree on Syria cease-fire plan"